Hatton Gardens, as viewed to the southwest from the Humboldt River. The skyline of neighboring Lancet and Easton is visible in the background to the left. Hatton Gardens is a five-block neighbourhood in eastern Algonquin, Liberty City. The neighborhood is located along the Humboldt River to the east, bordering Middle Park East to the north by Nickel Street, Lancet to the south by Lorimar Street, and Star Junction to the west by Columbus Avenue. As is with Midtown Algonquin neighbourhoods to the east, Hatton Gardens contains several high-rise apartments and commercial buildings. The area does not strictly draw inspiration from one district, but features several landmarks based on real-life counterparts roughly located in the same part of Midtown Manhattan (predominantly in the Turtle Bay area). The district is described as a "fashionable" shopping district, although the player has little available interaction in the area. Hattons Garden is primarily served by one station, Manganese East on the Algonquin Outer Line, with entrances off Manganese Street and Albany Avenue outside the Civilization Committee complex. Along the neighborhood's western border lies East Park, the nearest station to Hatton Gardens that provides access to the K/C Algonquin Inner Line. The Civilization Committee complex, located at Albany Avenue. The complex is actually situated in both Hatton Gardens and Lancet; only the half of the complex containing the garden is located within the borders of Hatton Gardens. Jerkov's Cossieur's Bar at Albany Avenue and Maganese Street, an upscale bar which the player can bring their friends or girlfriends to. Panoramic offices at Bismarck Avenue, housed in two modern towers. The Civilization Committee complex is evidently based on the United Nations Headquarters in Tudor City. Prosperous Towers, apartments across Albany Avenue from the CC complex (technically located in neighboring Lancet), are based on co-op residential towers at Tudor City Place and referencing the proximity of the aforementioned Tudor City apartments with the UN Headquarters in New York City. Columbus Cathedral, occupying a block at Lorimar Street, based on St. Patrick's Cathedral, which is a Roman Catholic Church. 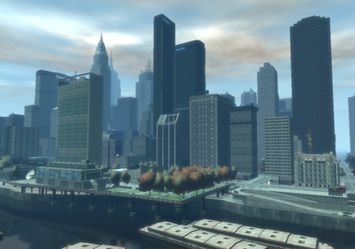 Like its real-life inspiration, a building complex emulating a simplified Rockefeller Center is located to the west across Columbus Avenue from the church grounds. The church, however, is aligned facing south, away from the complex. The Cleethorpes Tower at Manganese Street and Columbus Avenue is based on the Trump Tower. The tower is claimed to be built by Lyle Cleethorpes the 5th as a show of wealth. 867 Madison Ave (Polo/Ralph Lauren). The Madison Avenue facade is reused for both of the game's rendition's frontal, while the facade of the third floor is duplicated twice, adding two additional floors to the game's rendition. The Africa Tower, right in front of Civilization Committee, is based heavily on 336 East 45th Street (the Uganda House). The only major difference is the alignment of the building; the Africa Tower faces east, while the Uganda House faces north.